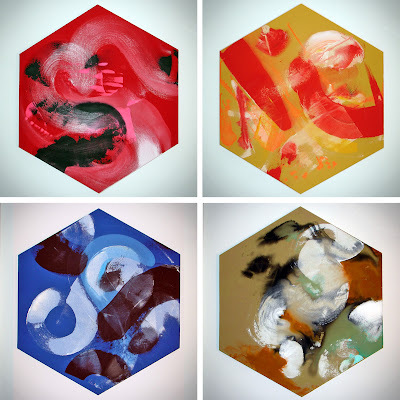 MWM NEWS BLOG: Hex Series. Process Shots. Finally getting around to working on my Hexagon Series. Painting background layers is always fun, so I figured I'd share a few and post photos of their evolution over the coming months. Keep in mind, these photos represent Layer #1. There is a good chance I'll reach Layer #100 on some of them, so it will be fun to document the build up. The series is eleven strong, all different colors of raw denim, stretched over wood frames. Lots of fun. This is just the beginning. Click-Zoom.